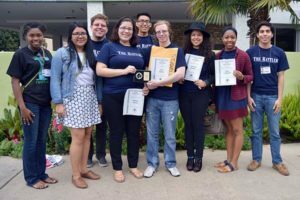 The Rattler newspaper won 18 awards at the 2015 Texas Intercollegiate Press Association Convention, held at the El Tropicano Hotel in San Antonio. The Rattler again took first for overall excellence in its division. The event included an estimated 500 participants from almost 50 colleges and universities across the state. This is the one of many awards the school newspaper has received under the direction of Brother Dennis R. Bautista, S.M., Ph.D., Associate Professor of English and Communications and Adviser for The Rattler student newspaper. This is an exciting time for The Rattler staff. “The Rattler has refined my University experience in many ways: it has taught me leadership, prudence, hard work, dedication, service and among these virtues, countless practical skills,” said Alex Eakins. Eakins is the editor-in-chief of The Rattler and will be graduating this spring. He recently passed the torch to Daniel Perez, incoming managing editor, and Tamara Garcia, incoming editor-in-chief, who were responsible for running the April 24 press weekend. Below is a full list of awards received at the 2015 Texas Intercollegiate Press Association Convention.